The International Mechanical Code article 504.6 stipulates the requirements for Domestic clothe dryer exhaust vent (pipe). In brief, the maximum length of duct permitted is 25 ft. This maximum length should be reduced by 2.5ft for each 45-degree bend and 5ft. for each 90-degree bend. 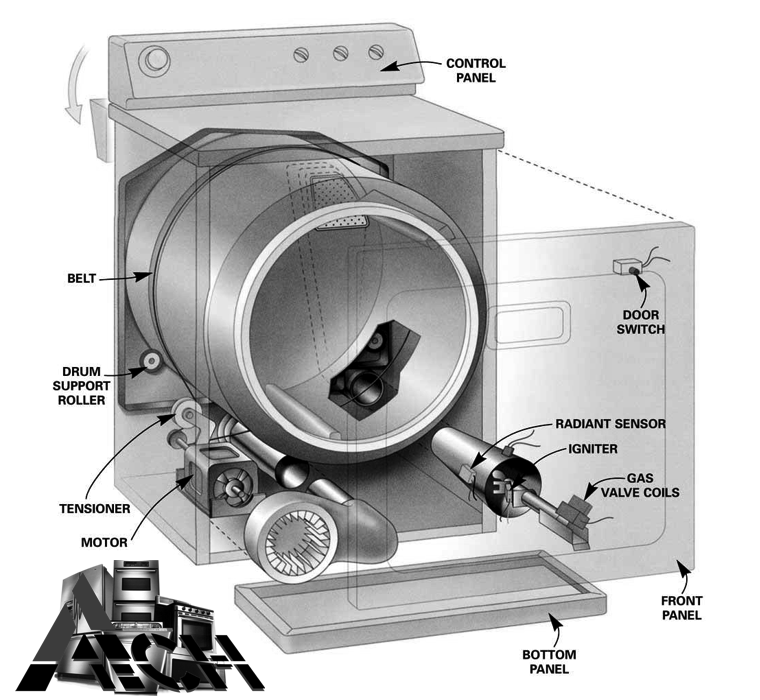 The duct should be a minimum nominal size of 4 inches in diameter. Most dryers have a thermal fuse, which burns out when the dryer overheats. In which case the dryer will either not run at all or stop heating. The fuse is usually located on the vent duct, inside the dryer. Before replacing the fuse, make sure the blower wheel is not broken or clogged, and there is nothing blocking the venting. Note: It is recommended by most dryer manufacturers to replace a hi-limit thermostat when replacing a thermal fuse. Belt - Dryers have a drive belt that turns the clothes drum. If the belt breaks, the drum stops rotating. Then you need to replace the belt, and often the idler pulley because the pulley tends to wear out at the same time. Motor - If the dryer motor only hums when you press the Start button, the motor may be burned out or something is stuck inside blower housing. Blower Wheel - Something is stuck inside blower housing. The problem with your dryer can be difficult to pinpoint without a clear indication of a specific defective component. Call us today for a same-day examination!